Take into consideration that my quilt was made with a large light gray polka dot background and bordered with a floral print. My quilt is 42” long (106.68cm) and 38” wide; (96.52cm) however, being that we are all unique and do things differently, I think it is wise to buy too much than too little, so I am giving you generous calculations which are enough for a 50”x50” piece (127cm x 127cm). For a center that is approximately 40” square (101.6cm), 1-1/2 yards (137.16cm) of light or very mottled print to enhance your flowers, remembering that your flowers need to be the “STARS” of the show. Focus fabric – for flowers: Read carefully – important. For this project, I recommend a dense, bright and colorful print with a repeat of no less than 6-8” (15.24cm – 20.32cm) with minimal background showing through. 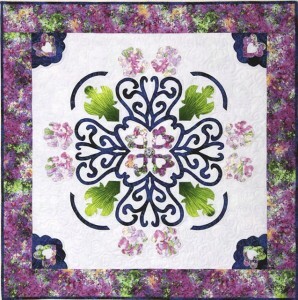 Too much background will take away from your design and overwhelm your quilt. You can purchase any repeat size over 8” (20.32cm); however, any repeat size over 8” (20.32cm) will be wasted unless you plan to use it again. It is very important that when you purchase this fabric that you be certain that you have received no less than 8 repeats or your project will not work. __x_____x_____x_____x_____x_____x_____x_____x_____x, so you should have 9 of the same flower or motif along the selvage side that faces you and if you don’t, you don’t have enough. For a center that is approximately 40” square, (101.6cm) to 1-1/2 yards (137.16cm) of light or very mottled print to enhance your flowers, remembering that your flowers need to be the “STARS” of the show. To make a 5” (12.7cm) finished border around a 40” (101.6cm) square piece, you will need 1 yard (91.44cm) – this will make at least six 5.5” (13.97cm) strips and will be plenty to go around. Thread: Matching or contrasting threads for blanket-stitching around all motifs. Fusible: 5 yards of 12” wide Lite Steam-a-Seam-II (or comparable (457.2cm) x (30.48cm). Templates: I will provide all the templates. 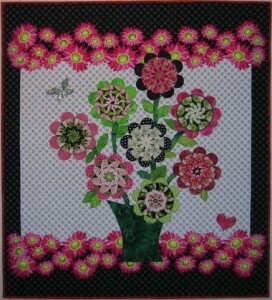 Stabilizer for machine appliqué – I recommend Ricky Tims’ Stable Stuff, but you can choose what you like. Background – 1-1/4 yards (this can be plain or mottled used with textured or printed fabric for the kaleidoscope pieces or vice versa….a textured or printed background with plain or mottled kaleidoscope pieces. Appropriate length of fabric for border and binding (this will be determined by the size of the quilt you want to make.